I got around to seeing Wonder Woman last week, and I’m glad I did. I had wondered how it would be treated, remembering with fondness the old TV series with the wonderfully earnest Diana Prince and her magic lasso, and I am pleased to report I wasn’t disappointed. Diana is as earnest as ever. Naïve about modern life, having been raised in isolation on the Amazonian island, she is also ignorant of the truth of her parentage. I can’t remember if that was part of the original mythos, but I loved the involvement of the old Greek gods, so again, whether it was or it wasn’t, it pleased me to discover she was really a goddess – that makes her abilities so much more understandable. I hadn’t looked at the cast list before going, so was surprised to find the lead male was Captain Kirk, er, Chris Pine. I just recently got to see Guardians of the Galaxy for the first time, and he was lead in that too. Can there be too much Chris Pine? I do feel sorry for the other guys in Hollywood – not many getting a look in (apart from Chris Hemsworth). But Pine does a great job and I certainly don’t object to watching him for a couple of hours. Set back during World War 1, this movie was filmed to great effect, contrasting the beautiful Grecian island of Diana’s childhood with the grim and monotone ‘modern’ world. Smog in London, grey and lifeless No Man’s Land, and the putrid saffron of a village bombed with mustard gas. The inequality of the sexes is hilariously highlighted by Diana’s total lack of understanding and utter disregard of it. She is a breath of fresh air, this woman of truly Amazonian stature. The story revolves around her quest to find Ares, God of War, and kill him. She has unshakable faith that his death will remove all evil from the world, and stop people killing each other. Her single minded objective is both childish and admirable, and drives the plot whenever an incident tries to derail it. Her strength of purpose and belief make her a truly strong role model. My only real disappointment with the film was the perpetuation of the cinematic staple that good must be beautiful and evil, ugly. The main villain, the chemist Isabel Maru, wears a mask to hide her disfigured face, which is revealed in the climax. Actually, it wasn’t as hideous as I was expecting, but I recently took a verbal bashing from one of my writer’s group about the use of scars on characters, either making them better looking (scarred heroes) or unsightly (villains), and how negatively this trope can impact on people in real life who have the misfortune to be scarred. Made me think. No one has yet given Hollywood this talking to. The plot is quite simple, but elegantly realised. The characters, especially the women, are strong and well acted. Even the golden lasso has its place, and watching Steve (Chris Pine) battling its compulsion and blurting out that yes, he is a spy, was, frankly, hilarious. In fact, the film has many moments of side-splitting humour, raising this movie above many of the other superhero offerings – much appreciated. 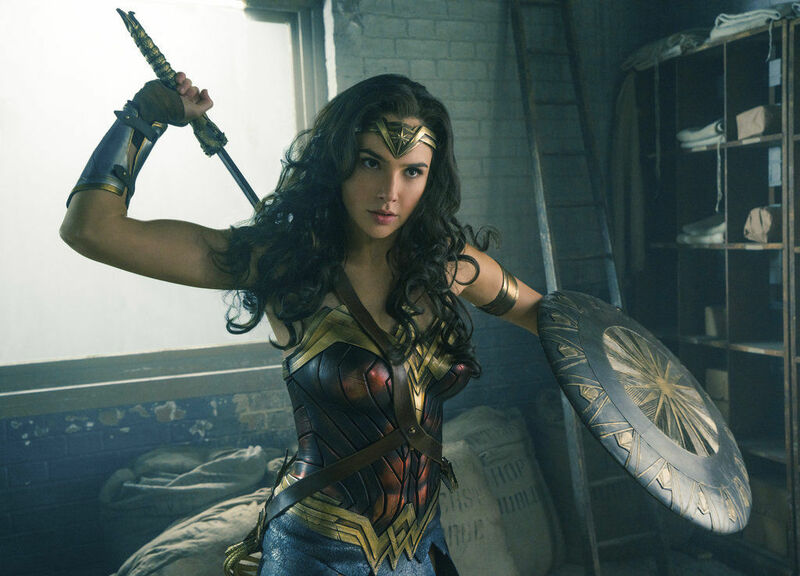 Wonder Woman isn’t going to challenge you, but for sheer entertainment and its portrayal of strong yet feminine women, it is well worth viewing. Yes, I’d have to look it up too, but I do remember reading about her when I was putting this review together, and comments being made about how a super hero film about a woman and filmed by a woman had proven that women could excell in this genre against expectation. Highlighting that sexism in the film industry is still rampant! I’m looking forward to seeing this movie. I think Saturday I’ll be going. I will certainly be buying the DVD when it comes out.